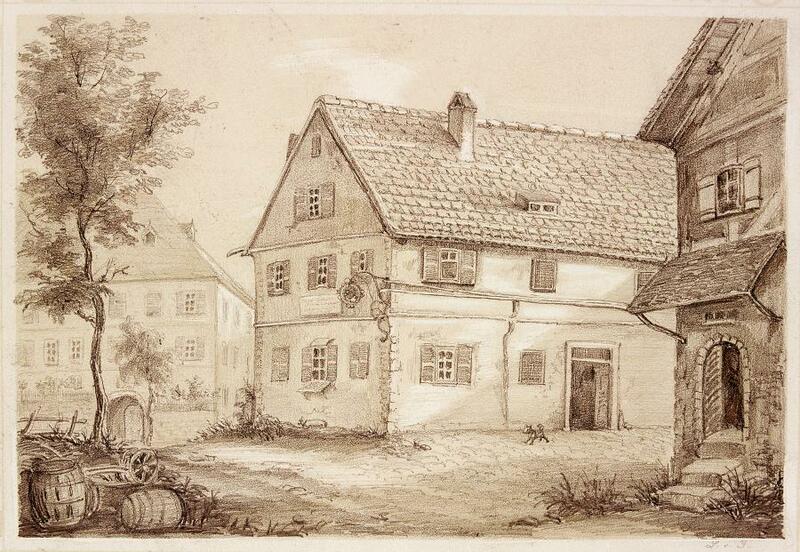 The house in Marbach in where Friedrich Schiller was born is a typical craftsman's house from the 1690s. Like almost all of the houses in the old town of Marbach, it was built on the remains of those buildings which were rescued after the fire had laid waste to the town in 1693. There are still two characteristic features of Schiller's birthplace which are clearly recognizable today: The first is the trapezoidal layout of the building and the second is a “crooked” passage from the wall facing the road leading to a corner. The young Schiller family leased and lived in only one single room on the ground floor. The owner of the house, Ulrich Schöllkopf, used the other stories both as a residence and workshop for making bags. The remaining rooms on the ground floor were used jointly by all of the residents, even the kitchen. In connection with the bankruptcy of Schiller's maternal grandfather, Georg Friedrich Kodweiß, the family was forced to live in these poor housing conditions. In addition to his occupations as both a baker and proprietor at the “Zum goldenen Löwen” inn, he was also employed as a wood inspector in the ducal office responsible for the safety of rafts and other sailing vessels. His risky dealings in the timber trade resulted in his having to relinquish to creditors the properties which had been amassed by the family over many generations. By then his son-in-law Johann Caspar Schiller had already used a part of his savings in a futile attempt to ward off bankruptcy and he was also forced to give up his doctor's practice. He volunteered for service in the Württembergische military where initially he was deployed as a regimental furir. With the birth of Friedrich in 1759 the Schiller family was now a family of four. However, as a soldier Schiller's father was required to spend so much time in military camps that his wife shared the one-room apartment with her children Christophine and Friedrich, who was two years younger than his sister. They left Marbach when Friedrich was only 4 years. Thus, evidence of Friedrich Schiller's life in Marbach fell temporarily into oblivion. Of course, no one could foresee that eventually he would become the most famous son of the town of Marbach. Not until 1812, seven years after Schiller's death, the newly-arrived citizen of Marbach Franke began to insure that his legacy would be preserved. He saw to it that older citizens of Marbach who still knew the Schiller family made testimonies at the City Office. Unanimously the house located at Niklastorstraße 31 was named as the birthplace of Friedrich Schiller and thus registered in the official city register. Soon after many admirers of Schiller visited the modest craftsman's house, but the idea of turning it into a museum was still a long way from being realized. For many years there was a heated dispute between the “Verein für Schillers Denkmal” in Stuttgart and the “Verein für Schillers Denkmal” in Marbach, which Instead of erecting a monument in Marbach, led in 1857 to the transformation of the house of Schiller's birth into a museum. In 1859, to celebrate the 100th anniversary of Schiller's birth the house was ceremoniously opened as a memorial site. It is one of the oldest literary memorials in all German-Speaking regions.